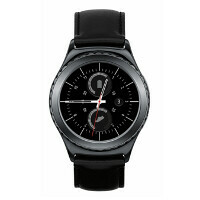 Starting tomorrow, you can pre-order from Verizon, the cellular-connected Samsung Gear S2 Classic 3G/4G smartwatch. The stand-alone timepiece can make or take phone calls, and send or receive texts without pairing to a smartphone. The Tizen powered smartwatch is priced at $399.99, or $349.99 with a signed two-year contract. The Gear S2 Classic 3G/4G can be added to your Verizon account for $5 a month. While pre-orders begin tomorrow at Verizon, the watch actually launches on March 11th, not only at Verizon, but also at T-Mobile and AT&T. It will be available in your favorite color, assuming that your favorite color is black. Plan on getting this and the S7 Edge pre-ordered via ATT. Should be a good combo. You will love it. I love my Classic/Note 5. I will probably sell it and get the Classic 4g/3g.